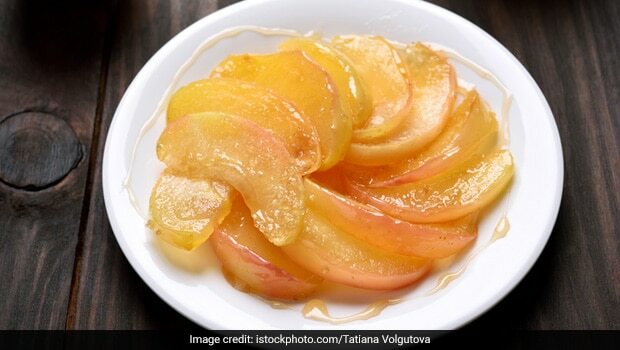 Be it roasted chicken or raisin pancakes, caramelised apples taste the best with almost everything. Not only do they enhance the taste of the savoury or sweet dish, but also add a subtle sweetness to it. Caramelised apples are great for breakfast; however, they can be savoured at any meal. If you’ve been looking for ways to caramelise apple at home, then you’ve come to the right place. The entire process of caramelising apples is simple and won’t take much of your time and efforts. This divine medley of texture and flavour is sure to tantalise your taste buds. The caramelised apples are meant to be subtly sweet and not overpowering and sugary. They also make for a delectable addition to ice creams, pies and crepes. You can make caramelised apples on special occasions and family-get-togethers as they are sure to be a showstopper. Note: The preparation time would take just 5 minutes; whereas, the cooking time would take hardly 10-12 minutes. – To begin with, take a large pan and add butter in it. Bring it on medium-high flame and allow the butter to melt. Once the butter is melted, add the sliced apples in the pan. Continuously stir the apples and cook them till they are tender. It will take just 4-5 minutes. Don’t overcook the apples as they might turn into a puree instead. – Meanwhile, add water to the corn starch and give the mixture a nice stir so that it dissolves evenly. Then transfer the cornflour mixture to the pan. Keep stirring. – Now, add in ground cinnamon, lemon zest and sugar. Lemon zest is added to impart a slightly citrusy flavour. Toss the mixture gently till the sugar begins to caramelise. Once this is done, remove from the flame and transfer the caramelised apples in a serving plate. You can use it as a topping over crepes, ice creams or pies. Note: During the whole caramelising process, it is important to prevent the apples from getting oxidised. If you expect a delay between slicing them and cooking them, soak the apple slices in a mix of cold lemon water for 5 to 10 minutes. Now, that we have shared with you an easy technique of caramelising apples, bring it to your rescue and start cooking. Here is a stellar recipe of banana pancakes with caramelised apples, which is not only appealing to the eyes, but to the palate as well. You can make it for breakfast as it is a perfect combination of health and taste in one go! If you’re looking for a dessert recipe with caramelised apples, here is an easy recipe that is sure to be loved by many. This one’s for all the ice cream lovers out there. The combination of ice cream and caramelised apples is a kids-favourite. Honey and cinnamon add a nice piquant aroma to the apples and also enhance its texture. – To begin with, add butter in a frying pan and allow it to melt. Now, add peeled apple bits and allow them to cook for around 4-5 minutes. Do give the mixture an occasional stir. – Add in cinnamon, a bit of lemon juice and honey to the pan. Cook the mixture over medium flame until the apple bits turn tender and the sauce becomes golden in hue. Your honey-glazed and cinnamon-flavoured caramelised apples are ready to be savoured. This variation of apple tastes the best with vanilla ice cream. Top it over few scoops of ice cream and serve it to those picky eaters at home. Be ready to be showered with tons of praises. You can also use this particular honey-glazed mixture over pancakes, crepes and on savoury delights as well. Happy cooking!